Are You an Existing Schwab Customer? Charles Schwab just released two new credit cards backed by American Express. If you have an eligible Charles Schwab brokerage account, you can apply for their new American Express co-branded credit cards. But before you do, let’s determine if they’re even worth applying for. For the record, an eligible brokerage account means a Schwab One Account or Schwab General Brokerage Account. This is also required if you want the Schwab Visa Platinum Debit Card, which can save you money on ATM fees. I have the debit card and it has been great for grabbing small amounts of cash when my own bank’s ATMs are out of reach. I had one hiccup while traveling in Europe, but otherwise it’s been quite handy. Anyway, about these new Schwab credit cards. As mentioned, there are two to choose from. The Schwab Investor Card from American Express is the cheaper of the two as it comes with no annual fee. However, the perks are also probably less attractive for most folks. You can earn a $100 statement credit after making $1,000 in purchases during the first months of membership, and you earn 1.5% cash back on all eligible purchases. This makes it quite comparable to the Discover it Miles card, or the Capital One Quicksilver card. Unfortunately, this also means it falls short of 2% cash back options like Fidelity Amex or Citi Double Cash. So I don’t know what the draw of this card would really be other than the cash being automatically deposited into your Schwab investment account. I guess it’s forced savings. That brings us to the the American Express Platinum Card for Schwab, which is just another iteration of the well-known and popular Platinum Card. The bad news is that it carries the usual $450 annual fee, which isn’t waived the first year. The good news is that you get 40,000 Membership Rewards points if you spend $3k in three months. Again, there are other American Express credit card offers that come with better spending bonuses and smaller annual fees or no annual fee the first year so I don’t know if this is a winner either. It includes the usual bells and whistles tied to the Platinum Amex such as airport lounge access, credits for Global Entry, and a $200 annual airline credit for incidental fees. 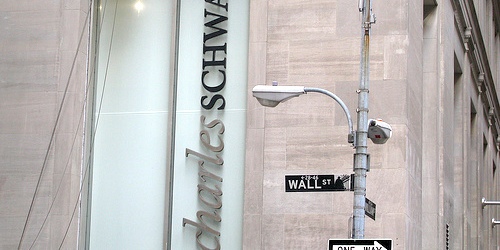 What separates it from the usual Amex Platinum crowd is two special Schwab-only features. First, you can earn a Schwab Appreciation Bonus annually if your qualifying Schwab holdings are at or above certain levels. If you have at least $250,000, you’ll receive a $100 Card statement credit. If you have at least one million dollars invested, that’s bumped up to a $200 card statement credit. This bonus will offset the annual fee and it’s a great perk if you already have that money invested with Schwab. The second unique draw to the American Express Platinum Card for Schwab is the fact that redemptions of MR points into your Schwab brokerage account convert at a rate of 1.25 cents per point. So 10,000 MR points equates to $125. While this sounds great, there’s one little issue. Most people collect MR points for the sole purpose of redeeming them for travel after transferring them to frequent flyer programs. This allows cardholders to squeeze a lot more value out of the points, much more than 1.25 cents per point. And if you were redeeming for cash, you could just go with the annual fee-free Schwab Investor Card from American Express instead, or better yet, a card that earns 2% cash back on every purchase with no annual fee. Overall, these new Schwab credit cards leave a lot to be desired, though they could make sense for someone with lots of assets already parked in a Schwab account. For most people there are probably many better card options out there.